Paws and Affection facility dogs are highly trained dogs assisting professionals who work with children in therapeutic, educational, or health-related settings. Unlike therapy dogs, who are well-behaved pets that visit with their volunteer owners, Paws and Affection facility dogs work full-time with professionals to aid children in reaching therapeutic goals. These dogs become a consistent and dependable presence in the facility environment, and their specially trained skills make them a valuable addition. 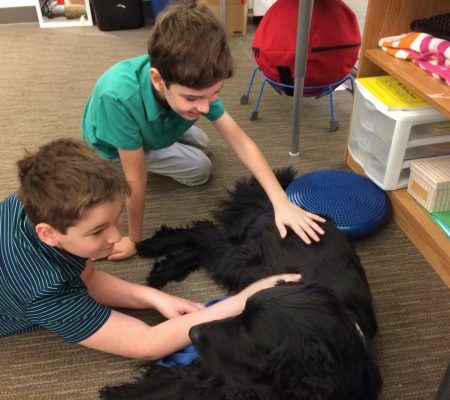 These dogs help increase focus and motivation during physical, occupational, and speech therapy, psychotherapy, hospital stays, and in the classroom. They also boost confidence in reluctant readers and offer comfort, kindness and friendship to children in times of stress or discomfort. Check out this article by Louie’s handler, Kelly Raudenbush, about how Louie helps children and families during his workday at The Sparrow Fund. If you work with children professionally, contact us to see if a facility dog might be a right fit. In addition to facility dogs, Paws and Affection also trains companion dogs and service dogs.